VISIA redefines the vision of skin care. Cutis’ computerized VISIA skin analysis identifies potential areas of improvement that may not be visible to the naked eyes. VISIA specializes in multi-point positioning system and live image overlay that makes it easy to capture perfectly registered images as well as on-screen and printed reports. VISIA easily captures and automatically analyses left, right and frontal facial views. 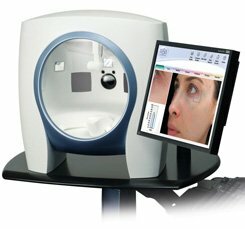 Using advanced imaging technology, computerized VISIA skin analysis provides meaningful skin evaluations of 8 different skin features – spots, wrinkles, texture, pores, UV spots, brown spots, red areas (acne, inflammation, Rosacea or spider veins) and porphyrins (bacterial excretions that can become lodged in pores and lead to acne). Instantly identifies skin conditions such as fine lines, giving you the opportunity to treat them as needed to prevent them from turning into wrinkles. Allows you to have a clear overview of your skin concerns via comprehensive visual consultations. Allows effective and personalized products and treatment recommendations that suit your specific skin conditions. Tracks the treatment progress and outcomes over time. Quickly generates customized reports including recommended treatments and on-going skin care.